–– Scott Mowry will be making another appearance on the Ohio Exopolitics Radio Show on Thursday, August 5, 2010 at 10 PM EST / 7PM PST. 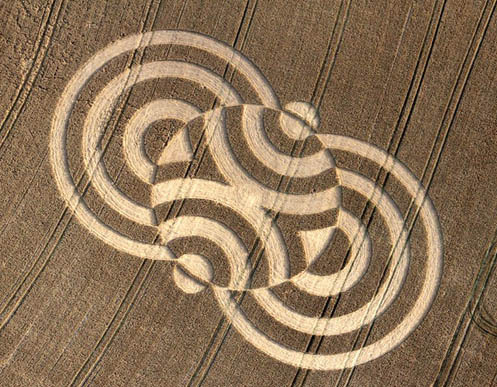 The 2010 crop circle season is in full bloom in the farm fields of England this summer and an absolutely spectacular harvest has already been reaped. Several of the most incredible crop circles that have ever been seen and photographed would appear to be unquestionably confirming the emergence of a new Earth that has been predicted by many, from the Bible to investigative researchers such as, Dolores Cannon, David Wilcock, Drunvalo Melchizedek, among others. And there is not just one of these "new Earth circles" but an an astounding five that have been sighted thus far since the month of May. Even while there is still another eight weeks of the summer season to go! These crop circles seem to be subtly preparing humanity for the separation of the Earth from one single planet into two –– a 3rd dimensional Earth that will remain on its destructive and dire path, and a whole new 5th dimensional Earth, that most of humanity will eventually move to and will unfold the long promised Golden Age, or Heaven on Earth. As matter of fact, this new Earth may already be birthing itself into existence and is simply awaiting the arrival of the human population to take root. And the crop circles themselves may be foretelling this! The first of these new Earth circles appeared on May 9, 2010, very near the ancient ruins of Stonehenge, in the town of Amesbury, Wiltshire. 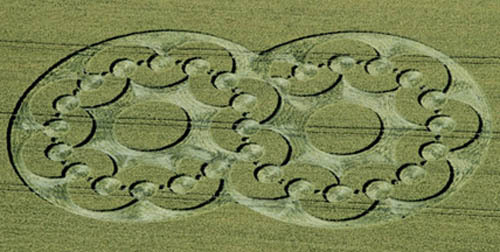 This crop circle could be demonstrating the process by which our present day Earth is being prepared on the energetic level to split into two. This formation contains three circles, representing our three dimensional reality at this time. The largest of the three circles would symbolize our Earth now, and the two smaller circles that appear to be spinning off, would symbolize the preparatory stages by which this separation process will occur. In the photo above you will notice the spiraling smaller circles have seven waves attached to them, which possibly could indicate the seven dimensions of reality or consciousness known to exist within the universe. In other words, we are moving from third dimension to the fourth, fifth, and perhaps, ultimately, the seventh dimension. At least some of us potentially will. 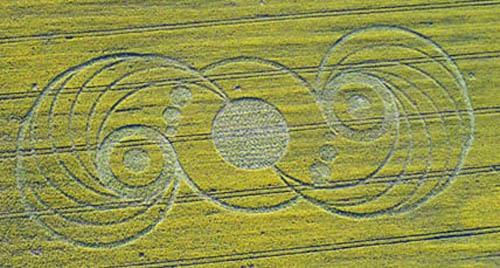 The second noteworthy crop circle appeared on June 16, 2010 in an area known as Chirton Bottom, near Urchfont, Wiltshire. In this circle we actually see two large circles separating, similar to the process of cells dividing known by the scientific term of mitosis. As cells divide, they go through a sacred geometrical progression which is universal law or principle by which all life follows as it moves through the developmental stages of growth. Also contained within this formation is a series of linked half circles that appear to form a chain. This chain could be symbolic of the human DNA strand that is currently undergoing a rapid upgrade in order to prepare humanity for residence upon the new Earth. You will notice how the chain moves from one circle into the other and then comes to a stop, as if to suggest that this DNA upgrade will reach a conclusion, which will signal that one is ready to move to the new Earth. Also note there are twenty-seven half circles altogether within the two larger circles. If you were to complete either one of the two circles you would get fourteen complete half circles within that larger circle, and only 11 half circles in the remaining larger circle. Two of the half circles would be on the border line and therefore cut in half, which would make for a total of 12. In Pythagorean numerology, the number 27 would be a reduced to the single integer of 9 (2 + 7 = 9). Nine is the number known to represent completion. And the number 14 would be a 5 (1 + 4 = 5) and thus, the number 5 would be representative of the fifth dimension. While the number 12 is a 3, (1 + 2 = 3), which would be representative of the third dimension. So in essence, this crop circle is communicating to us that we are evolving to a higher species as we are nearly ready to move from the 3rd to the 5th dimension! The third new Earth circle was found on July 18, 2010, in an area known as Woolaston Grange, near the town Clap-Y-Ares, Gloucestershire. Here we clearly see the separation process unfolding with the formation of a sacred geometrical pattern known as a vesica piscis, that is found in the center, between the two larger circles. The vesica piscis is similar in shape to that of a football or an egg, that is produced when two circles begin to divide, or, as the two larger circles separate from one another. Or, as if two cells were dividing. The vesica piscis can also be interpreted as a symbol for the womb, and is a definitive sign that a new life, or a birth, is about to unfold. Once again, absolutely confirming that a new Earth is being birthed, or perhaps, it is emerging at this point in our evolution. Or, could this vesica piscis be indicating a stargate or portal is opening that will allow us to be reborn into this new Earth as a whole new more highly evolved human being? The series of smaller circles within the two larger circles, appearing like ripples or waves in a pond, would seem to indicate the energetic waves that will be necessary to make this separation possible. On July 26, 2010, the fourth and the most magnificent of all the new Earth crop circles was discovered in an eastern farm field in the town of Alton Barnes, Wiltshire. This circle offered the most definitive evidence yet for the new Earth prophecy. The Alton Barnes circle is by far and away the most sophisticated and complex design that very clearly shows the new Earth separating from the old. Once again, we find the vesica piscis pattern in the middle, however, this time there is seen a series of ten smaller circles inside of that formation, all linked by a spider web pattern. These ten tiny circles inside the vesica piscis would represent the nine planets within our solar system that we are aware of: (Mercury, Venus, Mars, Earth, Jupiter, Saturn, Neptune, Uranus, Pluto); plus the addition of a tenth planet –– which of course would be, the new Earth. Also contained within the two larger circles are found some rather interesting hieroglyphics that would seem to offer proof of an extra-terrestrial signature of some origin. As in the Woolastan Grange circle from July 18th, there are again found two smaller circles that would appear to be magnifying, or highlighting, the areas on the right or left where the split between the two Earths is forming. Perhaps these magnifications are drawing attention to the timeline that we are now in and pointing out that this separation process has now begun in earnest and will continue to unfold through the next several years. Although, admittedly, that is merely speculative at this point. 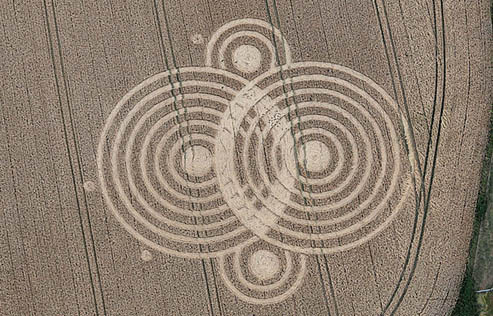 The fifth and final new Earth circle was seen on July 27, 2010 in area known as Beggar's Knoll, near Westbury, Wiltshire. This pattern, as in the one from Woolastan Grange from July 18th, appears to be representing a series of energetic waves engulfing both the new and old Earth. The circle in the middle which can be interpreted as counter-rotating waves, may be representing a magnetic pole shift that could be part of the energetic process to bring the new Earth into being. And yet again, we find the magnified or highlighted areas to the right and left of the separation points, although this time with much smaller circles. Counter rotation is otherwise known as hyper-dimensional, which is the physics that allows a physical body to move through different dimensions. The human body is able to traverse through the dimensions by way of the merkabah, an ancient Jewish word for "light vehicle". The merkabah is created by counter rotating the two star tetrahedrons that comprise the sacred geometrical shapes of the human body at a very high rate of speed, thereby creating a sphere or orb –– or, in essence, a space vehicle. This may be the same principle by which UFO's are able to travel from other dimensions and across vast distances of space. Perhaps then, the Earth itself will become a light orb itself in order to move into the higher 5th dimension. 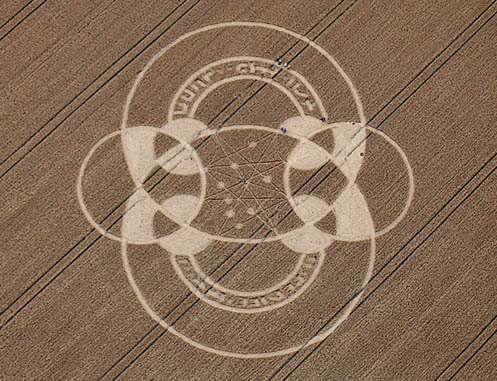 As if to offer a clear and direct signal to humanity, these five crop circles combined would appear to be broadcasting to the world the same overall themed message –– the time has arrived for a new Earth to be born, and thus the birth of a whole new higher level human being. Dolores Cannon, for one, has reported that the Earth will be separating in a very similar fashion as the same as the process of two cells dividing. Her information comes directly through her many hypnotherapy clients she has taken on past-life regressions over the last forty years. She has been able to identify three specific waves of souls that began arriving in the mid-1950's, shortly after atomic weapons were deployed on planet Earth during the 1940's. 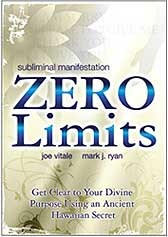 Alarm bells were set off throughout the universe when nuclear weapons were used and a call was sent out for souls to come to Earth in order to save it from human destruction. The rescue plan involved placing higher evolved souls upon the Earth in order to raise the vibrational frequencies, which would then make it possible to split off a whole new Earth into a higher dimension. This movement of an entire planet into the fifth dimension has never been attempted in the universe ever before! It has drawn the attention of many, many extra-terrestrial species from across the universe who are here to observe, or if necessary, to assist. This would account for the massive amount of UFO sightings, alien abductions, and thus, crop circles that have been steadily on the rise over the last fifty or more years. All in preparation for this grand event of a new Earth which will perhaps culminate around the year 2012, or for some, maybe even sooner. Each and every year, crop circles expand in their design and sophistication to embody more and more deeper concepts. 2010 is no exception and the appearance of these new Earth circles is a direct reflection of the evolution of human consciousness. We have arrived at that magical hour! Clearly, some crop circles that appear each year in the fields in England have been made by human hands, but many others are simply far too complex and way too profound to have been made by anyone other than not of this Earth. 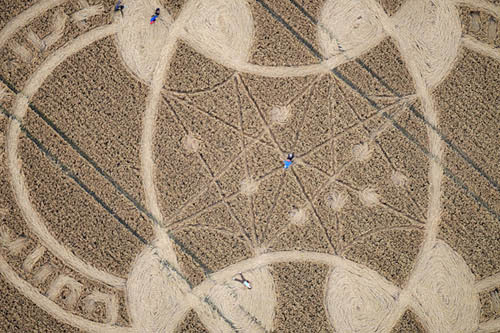 With the appearance of so many crop circles that center around this new Earth theme, it seems only natural to expect even more will likely materialize before the season is over in October. And as far as we are concerned, the more the merrier –– bring them on! The Golden Age, my friends is upon us, and the invitations are being sent out to all of humanity. Let's get this party started! Three days later on July 19, 2007, another crop circle appeared in Martinsell Hill, near Oare, Wiltshire that looked strikingly similar to the British Petroleum (BP) logo. More information can be found at the cropcircleconnector web site.